At the end of Operation Battleaxe the 22nd Guards Brigade had to retire from Fort Capuzzo, which they had captured only two days before, as they were in danger of being surrounded and cut off. I thought I’d run a scenario loosely based on this as a follow on from my Operation Battleaxe scenario from a few weeks back. Operation Battleaxe has failed to relieve the Australians at Tobruk. In the previous days engagements the 4th and 7th Armoured Brigades lost over half their tanks and have fallen back. In danger of being cut off and surrounded the Guards brigade must retire at once! 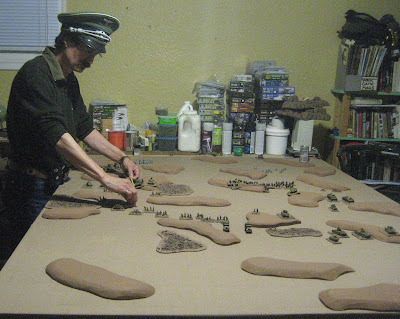 Similar to the Pursuit scenario from the Blitzkreig Commander book except that the British had to deploy anywhere on the German half of the table. As the table was 2m the closest the British (and Scottish...) could deploy to their table edge would therefore be 1m – so I decided to give them 10 turns to get off the table rather than the 8 turns in the standard scenario. I took the British forces and Gary took the Germans. I planned my scheduled assets and then we all set up. I basically planned my barrage to come in right where my infantry started the game – except on turns four and five – guessing that that’s when the Germans would get there. It they weren’t quite there by then – that’s okay, hopefully it would act as a deterrent to proceed for a turn or two giving my lads a couple of turns to skedaddle! The British line at the start of the game. The Germans rolled onto the table. The dismounted infantry moving further than the motorized troops…? General positions at the end of the German turn. If you can’t tell the thin line in the foreground are the British. They have to get off the table edge at the bottom of the picture. Beyond the British are the Germans in hot pursuit! The tanks trundled off in the general direction of the Suez Canal for one move…and that was it for the British… No artillery. No successful orders from any of the other HQs. Not a good start. The commander of the shattered remains of 7RTR called out to his men something like “Come on, lads! Pip-Pip! Tally-ho! Last one back to Alexandria’s a rotten egg!” The tanks scored a command bonus and tore off into the desert with as big a cloud of dust as Matilda could churn up! The bulk of the Guardsmen, however, decided to remain where they were. Taking that give noe ground/never retreat thing abit far if you ask me! The CO, however, successfully directed the Brigade and divisional assets (AT and MG Platoons) and one company of Guardsmen to the rear for a couple moves. The British begin a staggered retirement. 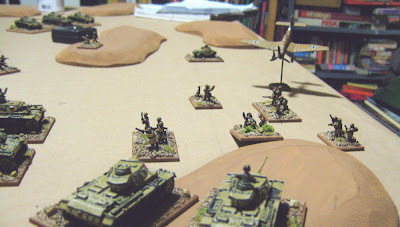 The 1st Panzer Company, on the west side of the table – pursuing the Matildas, move. The 1st Infantry Battalion, following the 1st tank company, move. Three times. By the end of this turn they’ll have gone twice as far as the lorried infantry in the 2nd Battalion. The 2nd (lorried) Infantry Battalion debus. That’s all. 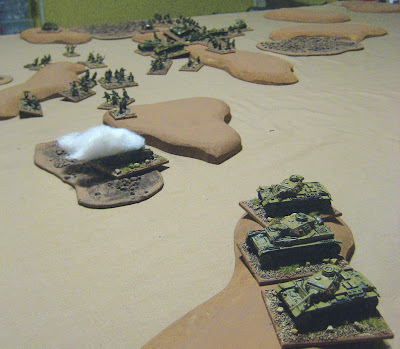 The 2nd Panzer Company rolls up and pounds the Guardsmen, still dug in, in their original positions. Three platoons are suppressed. The German artillery also catches retiring guardsmen out in the open and suppresses two platoons of them as well as the CO!!! The Matildas open fire in the Initiative Phase and suppress three platoons of panzers! Carrying on in the Command Phase, they shoot them up some more knocking out one platoon and forcing another to retire 9cm (SO CLOSE!!!). They then retired for two moves! A few of the unsuppressed guardsmen did a reaction move away from the Germans in the initiative phase (“When are they going to give us the order to leave” – “EFF the order there’s a bloody German tank company just about on top of us, let’s go!”) and continued on for another move in the Command Phase. The General situation at the end of Turn Three – Gary’s starting his moves for turn four already. The 1st Panzer Company got in four round of firing. This wiped out one platoon of Matildas. The platoon that’s about to snuff it can be seen at the extreme right of the picture. “Artillery caused havoc” – that’s all I wrote down for notes. I don’t recall exactly what happened, but I imagine it involved this lot of Guardsmen (in the picture above) being suppressed. The 2nd Panzer Company continued to pound the Guardsmen to their front (above). They knocked out an entire company worth of them. I imagine, rather than dying to the last man as many wargamers might assume when three stands are taken of in such a situation, that after a short pummeling a few dying and a few more being wounded, the majority would have given up in this hopeless situation and began their long march into captivity. The German infantry all moved forward a bit. The CO managed to retire the troops under his control a considerable amount. Maybe four of five moves worth, I can’t remember. Here is the general situation at the end of Turn Four. At this point I realized the camera was set on ISO 800 – hence all these grainy pics in the first half of the game. CURSES! A lot of moving took place. That’s about it. Well for the on-table units…. ….the Stukas came screaming in dropping bombs on the Matildas again. Hitting two, suppressing one. The second turn of scheduled artillery came in. Gary had conveniently moved his Germans up into the barrage zone thinking I couldn’t possibly hit the same place two turns in a row! Loads of stuff was hit. Two infantry, the infantry HQ, and the FAO were all suppressed. All units at the front of the advance, effectively slowing the Germans advance for the next turn (as they couldn’t advance through suppressed units). That was all I wrote down for the British this turn. I assume they also did some retiring. But I can’t remember who exactly issued what orders and who went how far. Gary had to go. There were some rowdies making an awful lot of noise out in the street, so he decided to stick around and play out one more turn in hopes they would leave. The Stukas, though called in could find no targets. The 1st Infantry Battalion assaulted some of the trailing Guardsmen. Unsuppressed Guardsmen. I don’t think Gary will be doing that again. Despite having two units in base contact with my one, and five or six units in support, I shot up the one that attacked my front on the way in and did a further three hits in the close assault for a total of six. 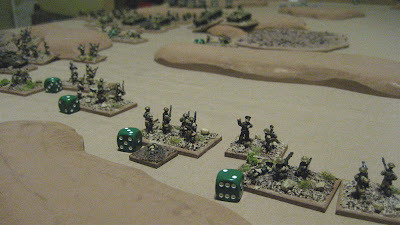 Gary, out of all the dice he rolled, only scored four – if he had scored one less the assaulting units would have been wiped out and three quarters of his battalion suppressed! As it was one of the assaulting units was wiped out the other was suppressed and retreated into one of the supporting units directly behind it, suppressing it as well. The Guards platoon used their consolidation to move just a touch closer to Cairo. The hooligans outside had calmed down or buggered off so Gary took his leave. I decided to soldier on as the game was just getting to the exciting part. The tanks made two moves towards salvation. The FAO made the only successful roll in the entire game. I swear ta gawd this is what happened. He called in the artillery on the nicely packed together German infantry battalion immediately to his front (less than 10 cm to the nearest one, less than 20cm to the center of the mass!) A barrage wouldn’t have caught any significant additional Germans, but would definitely have caught some retiring Guardsmen so I figured I might as well call in a concentration… The guns wiped out five units (three infantry, one MG and one mortar) as well as the HQ! The other four units caught in the maelstrom of 25 Pdr shells were suppressed. 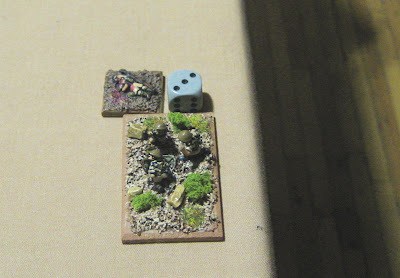 No really, that’s what I rolled – they’re infantry in the open with 9 dice pounding them! The Tanks rolled a command blunder (“CEASE FIRE!”), with no appreciable effect – other than to keep them from going anywhere this turn, and the CO got everyone under his direct control to move once. The General Situation at the end of Turn Six. The little bunch of troops just to the left of center of with the little grey dice next to them are the shattered remains of the German 1st Infantry Battalion. With initiative fire some German infantry suppressed two platoons of Guardsmen. These were probably the ones that just survived the assault by the 1st Infantry Battalion. 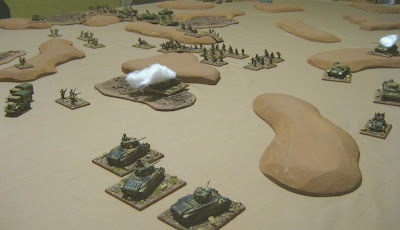 1st Panzer Company made one move. 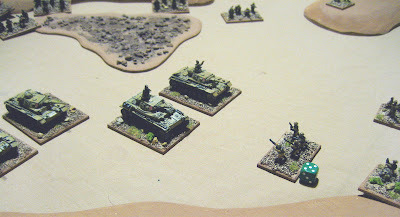 The 2nd Panzer Company got caught in a crossfire (Command Blunder!). The FAO was finally back in action and called in artillery on some retreating Guardsmen, suppressing an entire company of them. Stukas dive-bombed some infantry, suppressing them. The tanks and AT detachment rolled off the table this turn, as did the MG platoon. The rest were probably suppressed. Initiative fire saw another Guards platoon KOed. The 1st Infantry Battalion also made one move, fired on yet another Guards platoon knocking them out the action, and then proceeded to move some more. The 2nd Panzer Company rolled forward twice, over-running the Guards HQ. Artillery managed to hit two Guards platoons, but they soldiered on un-phased, the CO and FAO weren’t so lucky – they dove for cover and stayed there for a turn…! The 2nd Infantry Battalion’s HQ failed to issue any orders this turn. the CO fired him and took over. He got the battalion moving. The moved once. Then they moved again. They he rolled a command bonus and they did a double move. Then they moved one more time…. They had finally caught up with the infantry that had started the game on foot! The RTR HQ, which was still on the board – and the only un-suppressed command unit, issued one order to three Guards platoons to move… that’s it. This is the general situation at the end of Turn Eight. Things were looking a little grim for the British. At this point I had six units off the board, seven units knocked out, and four still on the table. I needed to get two of them off to achieve a major objective! Of course the Germans only had to knock out two more to cause break tests…. 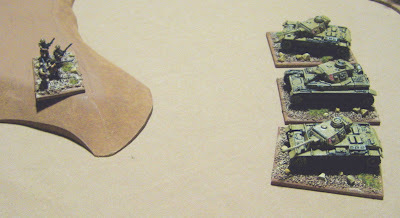 The 1st Panzer Company rolled up and blasted one Guards platoon out of existence. 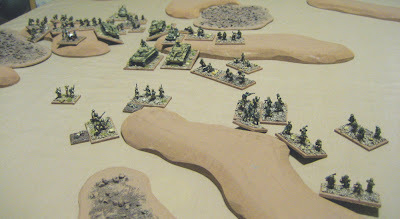 Then the 2nd Panzer Company rolled up and pounded a second Guards platoon scoring five hits, but not one suppression!!! 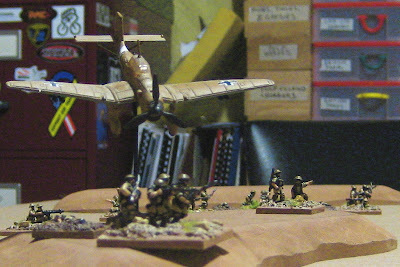 The Stukas were called in and bombed another Guards Platoon to bits – there I am at my breakpoint…. The infantry all swarmed up, but took no further action. 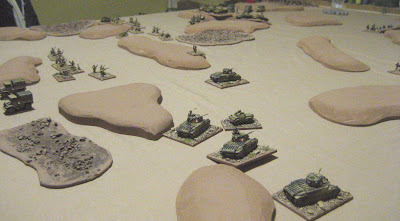 Blurry though it is this is the situation at the end of the Germans half of Turn Nine…. Can I pass my break test? Will I get those two final units off?! They pass the Break Test. So close, yet so far. 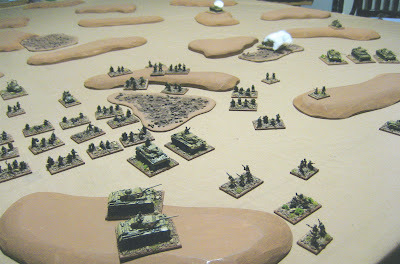 The final position of the last British unit on the table. A cracking good game I’m really starting to get a handle on these rules. 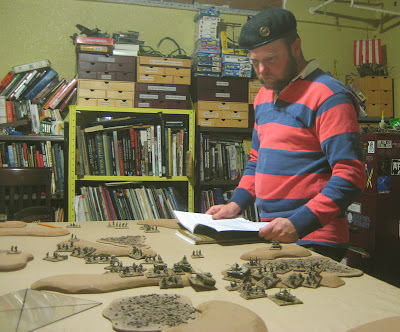 "There are some who call me.... Tim"
Welcome to Tim's Miniature Wargaming Blog. Here you will find reports (and pictures!) of games I have played as well as news (and pictures!) about my current modelling and painting projects. Ancient Rome, Enemies, Allies and Gladiators Gallery. 20mm - all the WW2 stuff... gone! There is nothing to see here.